This addictive flatbread, which we have made about a dozen times since we first tried it, was inspired by one of Melissa Clark’s cooking videos on the website of the New York Times. Her Feta-Stuffed Grilled Flatbread recipe looks amazing but it’s not vegan, so I searched around for dairy free options and cobbled together the following recipe. I didn’t have to look far for a vegan flatbread. Mark Bittman has a recipe for Grilled Lebanese Flatbread on the on the NYT site among his Minimalist columns. It is reproduced below with adaptations. Whisk together the salt, sugar, yeast and 1 cup of warm water in a large bowl. Let the mixture sit until it begins to froth, about 5 minutes, then add the flour and mix until well combined. Add more water, one tablespoon at a time, if the dough seems too dry. Cover the dough and let rise in a warm place for an hour. 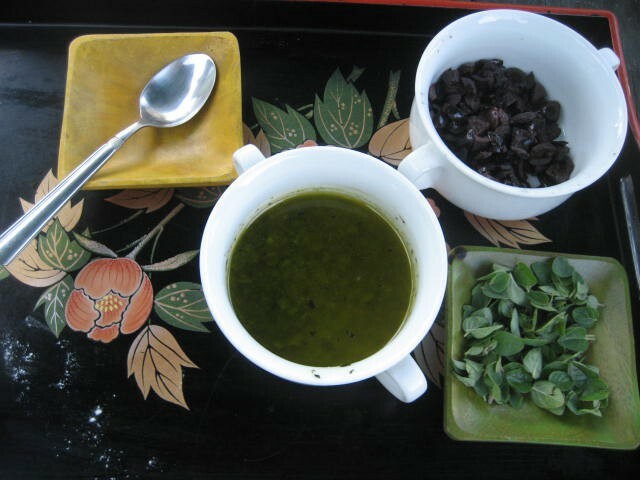 If you are using fresh herbs, blend them with the salt, pepper and olive oil in a food processor and set aside. If you are using dried herbs, you can just whisk them together with the salt, pepper, and olive oil in a small bowl and set aside. After about an hour, when the dough has puffed up, transfer it to a well-floured surface and knead until soft, about 5 to 8 minutes. Cut the dough into 6 equal pieces, form each one into a ball, put the dough balls on a plate, cover with plastic, and refrigerate for about 15 minutes. The recipe can be made ahead to this point. You can leave the balls of dough covered in the referigator for up to five days and have them ready for whenever the mood strikes for a flatbread. 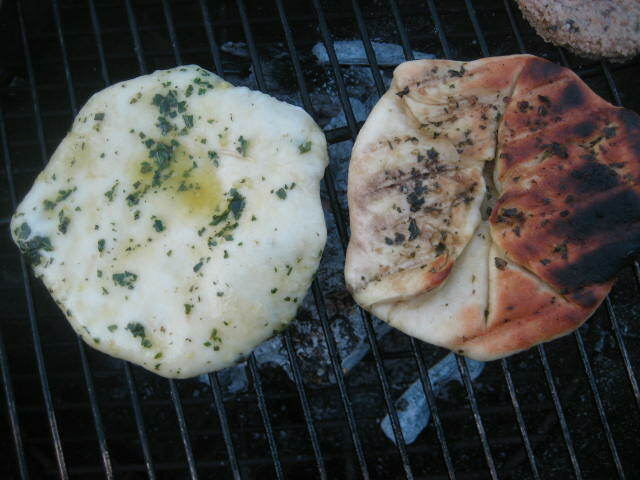 You can make the stuffed flatbreads on a grill outside or on the stove inside. If you are using a grill, make sure the coals are nice and hot and the dough is cool so it doesn’t stick. 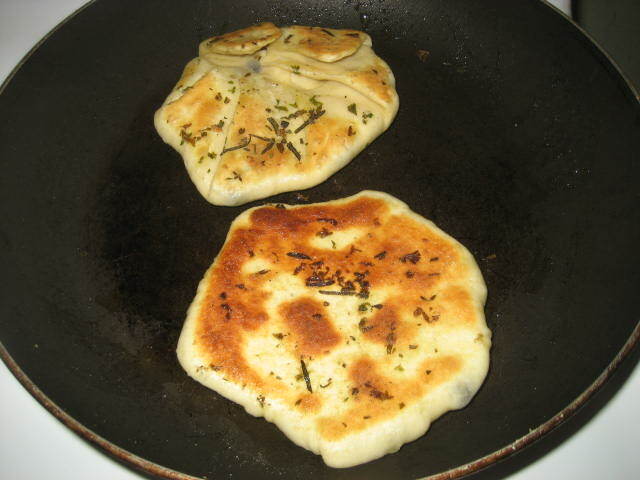 To make the flatbreads on the stove, just use a small non-stick frying pan with the heat on medium. Warm up the pan before cooking. Make one flatbread at a time. 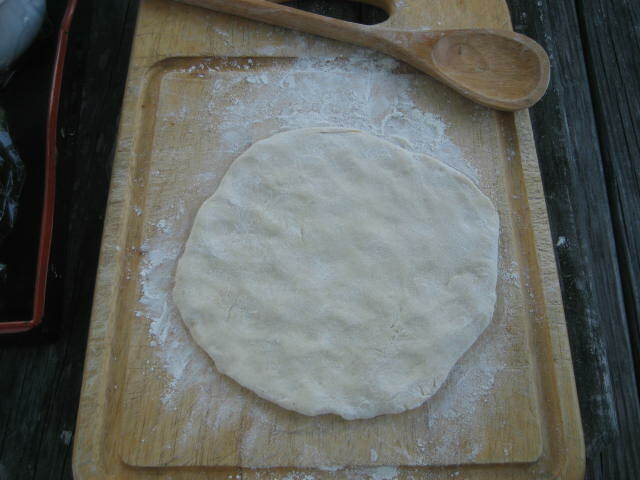 On a lightly floured surface, roll out one of the balls of dough into a circle about 6 inches in diameter. Brush the top with the olive oil and herb mixture. 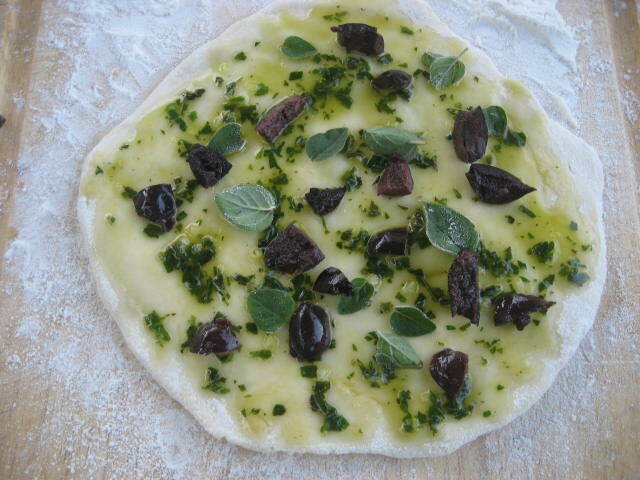 Scatter olives and/or capers or other flavorful toppings such as sundried tomatoes over the top. Don’t add too many toppings or they will pop out as you roll the bread. 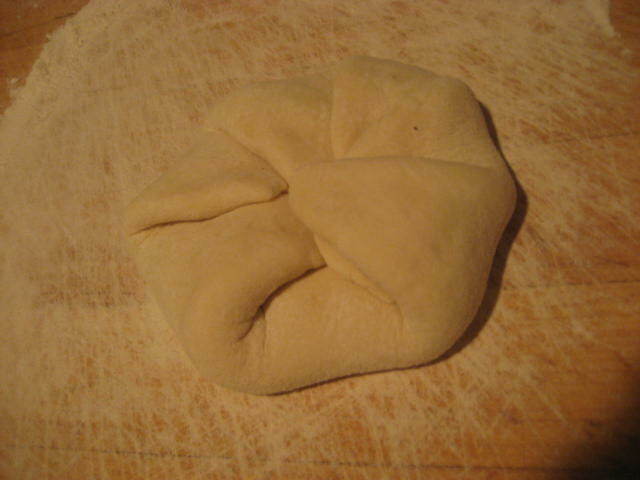 Fold up the edges of the dough over the center and press together to seal. Brush the top of the dough with the olive oil and herb mixture and put on the grill or into the hot frying pan, with the oiled side down. Brush the top with the olive oil and herb mixture. Cook over medium heat until the bread puffs up and the underside is nicely browned. Flip and brown the other side. If using a grill, cover while the flatbreads are cooking, but don’t cover if you are cooking them on the stove. Remove from the heat, sprinkle both sides with salt, cut into wedges and serve. This entry was posted in appetizers, side dishes, vegan and tagged bread. Bookmark the permalink.